Earlier today, I thought to myself: "How would I describe this performance if I could only do it in one phrase? ", as I toyed with the idea of a one-line report. The best I could come up with was "Helen Keller running an obstacle course". I was quite nervous about this one heading in, precisely because so many thought it would be a walkover. 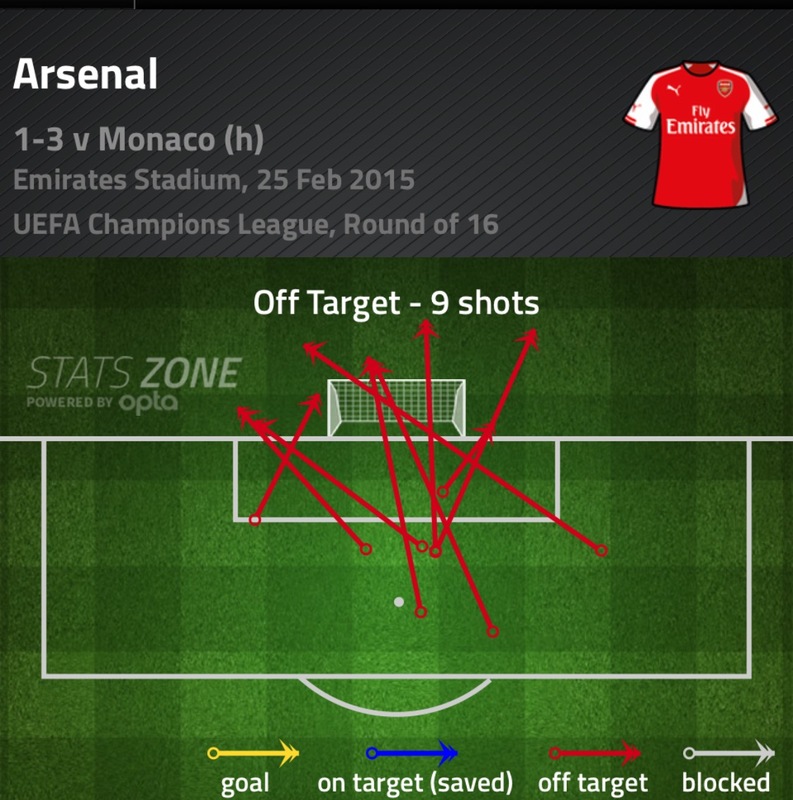 Well, we have now shipped six goals in two games, at home, against Anderlecht and Monaco. Once again, our guys turned up in hubris and arrogance, assuming that they would win simply because their shirts had a more impressive name than the opposition's. As it turns out, Monaco are a much better team than Anderlecht, and we got what we so thoroughly deserved. Again. I mean, just look at the team that Arsene picked today. Alexis Sanchez, Mesut Ozil, Danny Welbeck, Olivier Giroud, and Santi Cazorla all started. It was left to Francis Coquelin alone to protect the back four, and he was left to chase shadows as Monaco picked us apart down the wings all day. Just like Bayern did the last two years. Just like Milan did before that. The fullbacks may as well have been auxiliary strikers for how far up they were. Laurent Koscielny and Per Mertesacker got caught out more than once beyond the halfway line, rushing into low-percentage challenges. We never learn. Or, more appropriately, Arsene never learns. He tore into his players in his post-match presser, but he was curiously silent on who exactly should have been expected to prepare them to play differently. It's a puzzlement, yes? 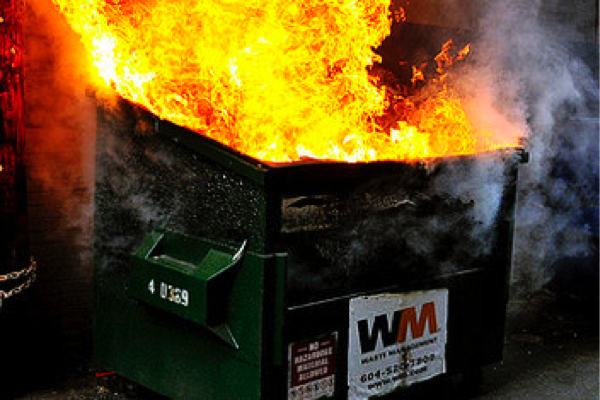 I don't know why people thought this was going to be a walkover, anyway. We had been on quite the run of form, on paper, but further scrutiny shows that it is more of an indictment of our opponents than anything having to do with us. We were aching to be turned over by the first decent team we played, in retrospect (the Manchester City result aside, and that is looking increasingly like an anomaly). The match was almost comical in how closely it followed the Arsenal First Leg in Europe cliche, as it earnestly followed the dance steps painted on the floor. Start out semi-quickly? Check. Miss a bunch of easy chances? Check. Get hit on the counter? Check. Get hit on the counter again? Check. Panic and bomb everyone forward, making a bad situation worse? Check. I know..let's play a game! I call it: "Who was the single worst Arsenal player out there today?" Some are going to go with David Ospina, but that isn't quite right. His paper-mache wrist on the third goal was utterly dreadful goalkeeping, but there wasn't much he could do about the other two. Seriously, the bend and the dip on the first one was bad enough, even before the deflection. No one saves that, and anyone who tells you otherwise is a doofus. Still, I knew I was always right about Wojciech Szczesny emphatically being our best goalkeeper, and I hope comes straight back into the team now. We move on. Despite only coming on as a sub, Alex Oxlade-Chamberlain has to be up for consideration as well. To his credit, he did score a lovely curling peach of a goal when presented with more time and space then Neil deGrasse Tyson could shake a stick at. However, his brain-dead giveaway on the halfway line led to the backbreaking third goal. Of course, 1-3 is far worse than 0-2, so really he was a net negative on the day. Oh, but there are better options for sure, though. What, then, of Olivier Giroud? Even though he is our only target man of note, he was still unceremoniously hauled off on the hour mark. I still think he's a damn good player on his day, but he was a special kind of awful on this occasion, somehow contriving to miss three glorious chances. There was a weird symmetry to it too, as the chances got easier as they went along, his attempts increasingly more pathetic to meet the challenge of not scoring. He would be a good shout, but there are still further depths to plumb, my friends! If it were up to me (and it's my report, so it is indeed), I'd call it a two-way tie between Koscielny and Mertesacker. What the BFG was doing on the second one, I have no idea. I don't know what happened with those two today, but they both displayed the positional awareness of a tranquilized tree sloth. Given that we were basically playing a formation with a keeper, those two, Coquelin and six strikers, we needed restraint and discipline from them. As senior players and seasoned internationals, we needed them to show leadership when the rest of the team was panicking. Instead, they were frankly the worst offenders of decapitated-chicken syndrome, and man, has it cost us large. Still, if we expand it to non-players, then of course Arsene is more culpable than the rest put together. The whole litany probably doesn't bear repeating - I'm sure you all know it by heart by now - but all of the old favorites were there. Our gameplan was overly aggressive, there was no Plan B, there was no adjustment when it was clear that they were killing us on the wings, on and on and on. So naive. So stubborn. So arrogant. The fact that he has the gall to call out the players is just the icing on the cake - if those weren't your tactics, then...umm...what exactly do you do here, mate? Sure, if Ollie had one of his Dr. Hyde days it might have been 2-2, but who else in world football at our level would be happy with even that? That is why I do not have the old anger any longer at results like this, or against those barbarians from down the Seven Sisters Road. The definition of insanity is doing the same thing and expecting a different result, so why would I expect Arsene to change now? But hey, it's not so bad. We only have two more years of this, amirite? Man of the Match: What a player Monaco have in this Anthony Martial. Strong, lightning-fast, gets in good positions, has drive and urgency...something tells me that he won't be a Monaco player for too long. Sean Swift is a contributing writer to The Modern Gooner, and is unbelievably thankful that Carey Price has ensured that one of my teams is not a maddening, schizophrenic train wreck. Arsenal players of various heights celebrate Tall's goal. But that's all neither here nor there (well, I guess it is there, if there is Monday, March 9, but I digress.) Fact of the matter is, it's time to focus on the league again, at least for 90 minutes as the return of the Champions League looms on the horizon. Arsenal sit fifth in the league, just two points out of third place but just seven points clear of eighth place. 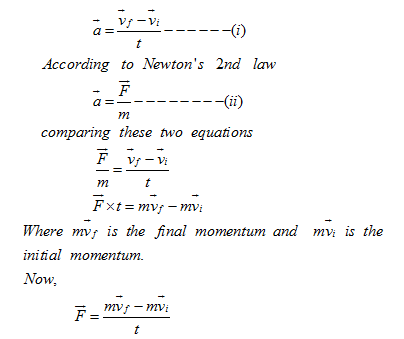 Every point is precious. Palace away is a tricky fixture (just ask Liverpool, or Spurs a month ago) but the Gunners know they cannot afford to leave points on the table against the 13th place club in the league. There are 39 points left on the table; let's take everything we can get. Well, the injury list doesn't look too different from last week's: Alex Oxlade-Chamberlain, Aaron Ramsey, Mathieu Debuchy, Mikel Arteta, and (heh) Abou Diaby remain sidelined. The Ox will return soonest, as he's just about back in normal training. Jack Wilshere has been back in full training for a bit now and could be available from the bench tomorrow. Arsenal may line up tactically similar to the formation they played against Middlesbrough last weekend, considering Ramsey's injury leaves them a little short in the defensive midfield position. Against Boro, Mathieu Flamini sat deep behind a midfield attacking four of Alexis Sanchez, Santi Cazorla, Mesut Ozil, and Danny Welbeck. If Wenger decides he needs two defensive midfielders, something to consider when playing on the road, he'll have to start Tomas Rosicky (as Mathieu Flamini faces a fitness test) alongside Francis Coquelin, while dropping one of the attackers. So that, in effect, is the question in this lineup: three attackers and two holding midfielders or four attackers and one behind Olivier Giroud? For the purposes of making a safe estimate, I'll assume Arsenal will play it safer on the road and go with the former. 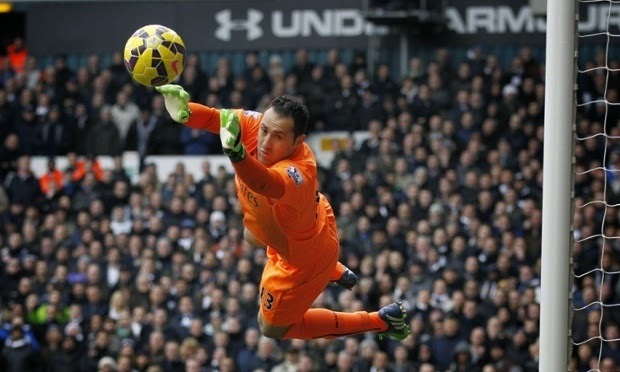 David Ospina should reclaim his place as the league goalkeeper until he does something to lose it. Hector Bellerin faces a fitness test with an ankle problem; Calum Chambers may continue to deputize if the young Spaniard is unavailable. Predicted XI: Ospina, Chambers, Mertesacker, Koscielny, Monreal, Coquelin, Rosicky, Cazorla, Alexis, Ozil, Giroud. Yaya Sanogo has been missing as of late with a hamstring injury, which is very Arsenal of him; he would not have been available to play against his parent club anyway. 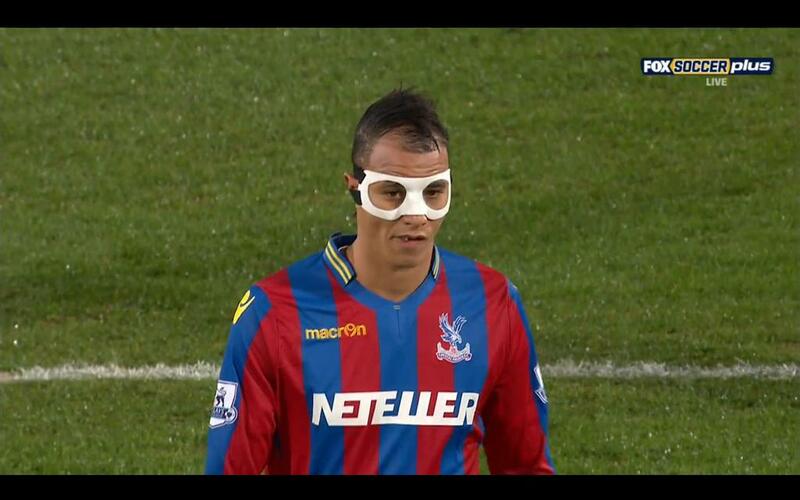 Marouane Chamakh suffered a broken nose against Everton a few weeks back and has been playing with the pictured stylish Batman mask for a while now. He was removed at halftime from Palace's FA Cup loss to Liverpool last weekend and certain sources seem to indicate that he'll face a late fitness test, but I don't know what the injury is, so I've just written "Batman" in the parenthetical and I hope it has made you laugh. Speaking of former Arsenal players, Jerome Thomas is out with a thigh injury, while Lee Chung-yong is out with a shin injury. There are doubts over Shola Ameobi's match fitness, as he has not played all season and just joined with his former Newcastle manager on a free this January. James McArthur is a doubt with a thigh injury and Mile Jedinak is a doubt as well. Predicted XI: Speroni, Ward, Dann, Hangeland, Souare, McArthur, Ledley, Puncheon, Bolasie, Chamakh, Campbell. Arsenal have bounced back from the loss at White Hart Lane to win two straight, meaning they have now won seven of their last eight across all competitions. The last time Arsenal won seven matches across an eight match span was last January, when they went unbeaten in 10. The Gunners also won seven straight to end last season, but the first win in that streak was over Wigan in a penalty shootout, which counts as a draw for the purposes of discussing form. If you really want to get technical, Arsenal won the first two matches of this season (the Community Shield and the reverse of this fixture) to extend that winning streak. Any way you cut it, it's been many moons since Arsenal last won this many matches in such a time frame. Perhaps more interesting is that Arsenal have scored at least one goal in each of those eight matches, dating back to the 2-0 loss at Southampton on New Year's Day. That loss was the only time in the last 25 matches where Arsenal were held without scoring, dating back to the 2-0 loss at Chelsea in October. Arsenal have been held without scoring a goal four times this season, all on the road; the other two were in the Champions League: at Besiktas and at Dortmund. Crystal Palace currently sit 13th in the table, five points clear of relegation. They were 18th on New Year's Day after a 0-0 draw with Aston Villa but have since, under the direction of Alan Pardew, won three draw, drawn one, and lost one in the league. They also bounced Dover Athletic and, more importantly, Southampton from the FA Cup before getting being knocked out by Liverpool last weekend. Palace had previously defeated Liverpool at Selhurst Park in the league; they've also beaten Tottenham at home this season. Despite those mid-to-high level scalps, Palace are 17th in home form; they've lost six, drawn three, and won three. Palace are a much better road team this year, losing only four on their travels compared to the six losses in South London. The Eagles have won just one of their last seven home fixtures. dicey than it needed to be. Arsenal won the reverse fixture 2-1 on the season's opening day at the Emirates. Brede Hangeland, signed over the summer from relegated Fulham, headed the visitors into the lead on the half hour mark but Laurent Koscielny equalized before halftime. Palace looked set to steal a point, but Jason Puncheon was sent off for a second yellow card in the 89th minute and Aaron Ramsey banged in a rebound for the winner early in added time. The Gunners held on to win this fixture last year, despite a red card to Mikel Arteta. With the match 0-0 at the half, Arsenal were awarded a penalty early in the second half, which Arteta dispatched nicely, but the Spaniard was soon shown red for denying a not-so-obvious goal scoring opportunity. 10-man Arsenal held their nerve, however, and Olivier Giroud secured the points with a counterattack goal in the 87th minute to seal a 2-0 win. Crystal Palace have beaten Arsenal only three times in 35 all-time meetings; two of their three wins came at Highbury, one in 1970 in the League Cup and the other in 1994. 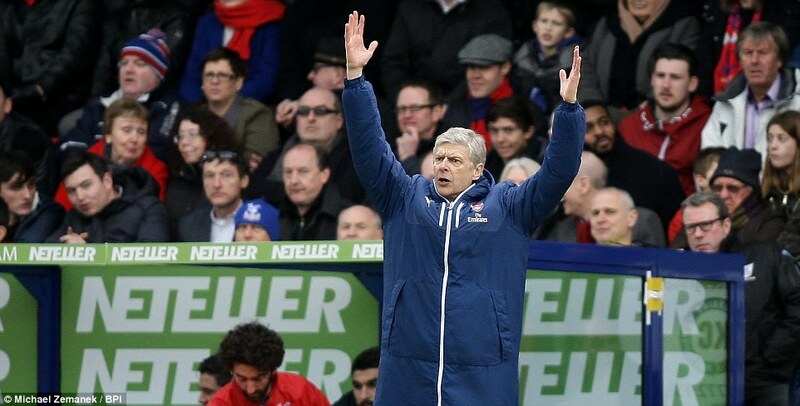 Crystal Palace have not beaten Arsenal at Selhurst Park since November 10, 1979, when they beat the Gunners 1-0. Since then, Arsenal have won six and drawn five in South London across all competitions. The referee is County Durham-based Mark Clattenburg. Arsenal have a remarkable record all-time with Clattenburg as referee, winning 21 out of 31 matches; they've lost seven and drawn three of those 31. One of the draws came earlier this season, however, as Manchester City came from behind to draw 2-2 at the Emirates in September. Clatts has worked two Palace matches this season: the 3-1 loss to West Ham in August and the 2-2 draw with West Brom in October. On Wednesday night, Clattenburg was in charge of the Champions League Round of 16 match between Basel and Porto; with Basel up 1-0, Clattenburg ruled out two potential Porto equalizers for offside before awarding the Portuguese side a penalty later in the second half. One of the decisions took about two or three minutes as the additional referee behind the net, Kevin Friend, consulted with Clattenburg regarding two Porto players impeding the goalkeeper from an offside position. Many of the articles about the incident focus on the controversy itself and not, you know, that the call was right. The match ended 1-1. Theo Walcott always does the "arms out like airplane wings"
Arsenal rebounded from last weekend's derby loss with three points, though they were not exactly earned in the most comfortable fashion. Leicester City put up a strong fight in the second half and Arsenal looked devoid of confidence despite their 2-0 halftime lead. Attention switches now to Arsenal's defense of the FA Cup as they play host to Championship leaders Middlesbrough on Sunday. If you look at a full table of English football, level-by-level, Middlesbrough occupy the spot directly beneath Leicester City, but facing off against last place in the Premier League is much different than first place in the Championship. The Boro are on fire, to the tune of six straight wins, including one over Manchester City in the previous round. 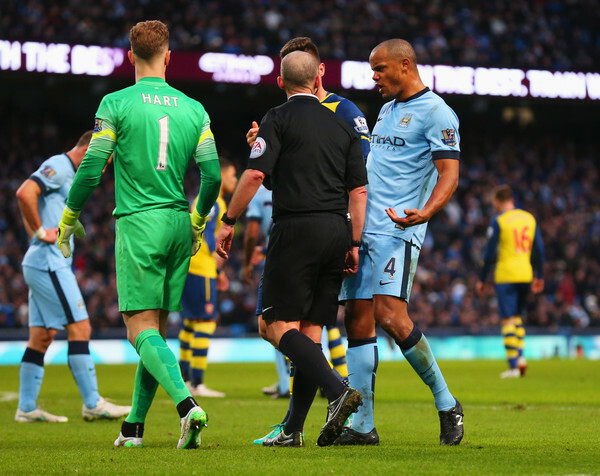 Arsenal will know they can take nothing for granted against an opponent that bounced City. Let's hope they can find their first half confidence from Tuesday and hold onto it for 90 minutes this time around. 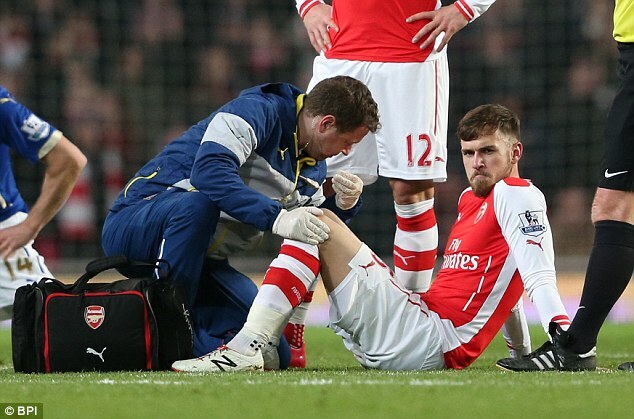 When Aaron Ramsey pulled up injured on Tuesday, my immediately thought was, "April. He'll be back in April." It turns out, it is a recurrence of his hamstring injury and will see him out for at least four weeks. Factor in a slow return to training and, yeah, late March at best for the Welsh midfielder's return. The good news is that evidence of the bionic nature of Alexis Sanchez has returned; he should be available despite taking a heavy knock to the knee on Tuesday. The question is, how much will Arsene Wenger rotate the squad? Boro are probably playing better football right now than Leicester City. Wojciech Szczesny is currently the cup keeper and should get the start. Calum Chambers and Kieran Gibbs could come into the back line, but I wouldn't start Gabriel just yet. Tomas Rosicky might retain his place, with Aaron Ramsey hurt and Jack Wilshere not yet 100%. 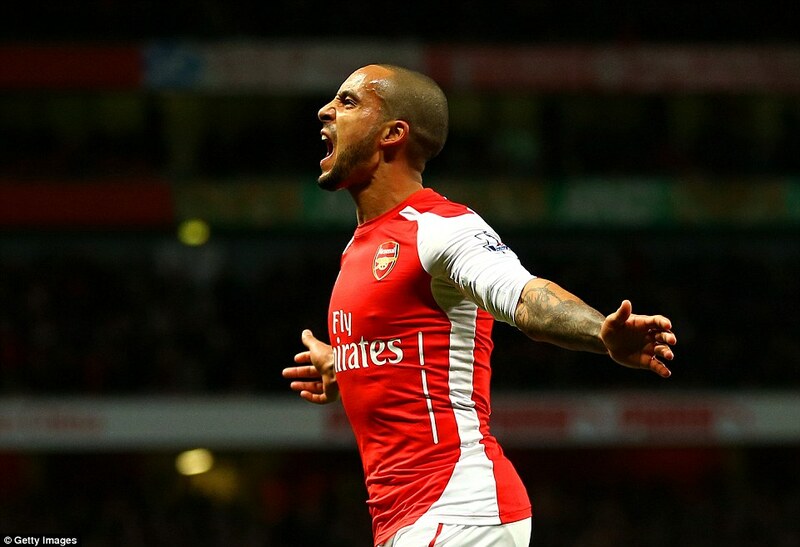 Olivier Giroud should come back into the attack, while Danny Welbeck could come in for Theo Walcott. Predicted XI: Szczesny, Chambers, Mertesacker, Koscielny, Gibbs, Coquelin, Rosicky, Ozil, Welbeck, Cazorla, Giroud. Manager Aitor Karanka, who spent three years as Jose Mourinho's assistant at Real Madrid before taking the Boro job, made seven changes to the side that beat Charlton last weekend for their midweek win at Blackpool. In the process, however, the club lost center back Daniel Ayala to a thigh injury; the Spaniard could miss three to four weeks. Boro, however, are secure at the position and will likely start Kenneth Omeruo and Ben Gibson. Tottenham loanee Ryan Fredericks should return to the right back position and George Friend should return on the left. In goal, Karanka is expected to continue to use his cup goalkeeper, Tomas Mejias. Adam Clayton and Grant Leadbitter anchor the center of midfield, while a start could be in the cards for Patrick Bamford. Bamford, on loan from Chelsea, scored the opener in Boro's 2-0 win at Manchester City in the previous round. Mustapha Carayol has been out since last March after suffering ligament damage in his knee. He's on the comeback trail now and was supposed to play in a reserve cup tie earlier this week, though that did not come to fruition. Right back Damia Abella has been out since September with an ACL injury of his own. 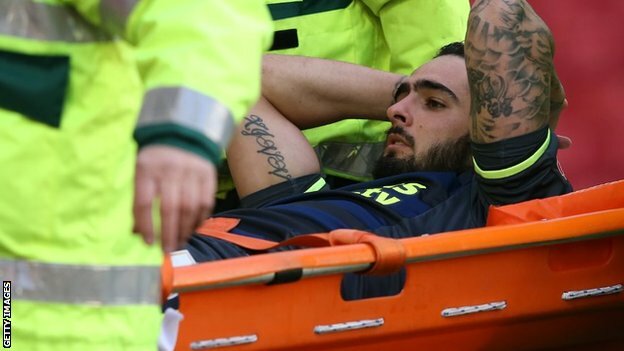 Rhys Williams ruptured his Achilles in the FA Cup tie against Barnsley in January; it was his first start since sustaining a similar injury 11 months prior and he lasted all of two minutes. Adam Forshaw, purchased from Wigan on January 28, is cup tied. The puzzle that is Arsenal's form continues; Arsenal have lost eight matches across all competitions this season and, thanks to Tuesday's win over Leicester, have only once lost consecutive matches. Of more significance to this upcoming match, however, is Arsenal's home form: Arsenal have only lost twice at the Emirates this season in 18 home matches, to Southampton in the League Cup and to Manchester United in the league. Arsenal are in an interesting string of fixture scheduling as well at the moment. Provided this cup tie does not require a replay, Arsenal will end up playing eight straight matches within the confines of London. That string could reach 10 if Arsenal win this match on Sunday and get drawn at home in the next round, before they travel to Monaco on March 17. Across all competitions, Middlesbrough have lost only twice since August: 2-0 at Wolves on October 21 and 2-1 at Ipswich Town on December 20. 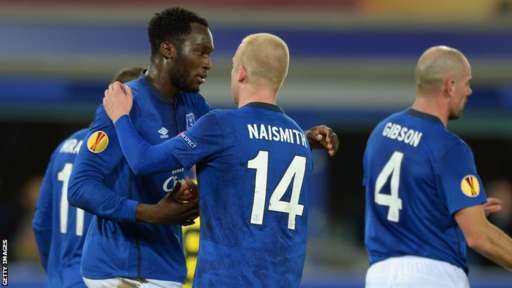 They also lost to Liverpool in the League Cup, but that was in a penalty shootout, which is considered a draw for the purposes of discussing form. That's two losses in 29 matches, including 18 wins and nine draws. In the Championship, they have won five straight, including a 2-1 win on Tuesday at Blackpool. The Boro have climbed the table, from 16th on August 30, to first place as of now. Boro equalizes against Almunia's bad hair. Arsenal and Middlesbrough have not met since the Boro were relegated in 2008/09. The last time these two sides met was at the Emirates on April 26, 2009; Cesc Fabregas scored twice as Arsenal won 2-0. The reverse fixture at Riverside Stadium in December of 2008 was a damaging 1-1 draw, where ex-Arsenal striker Jeremie Aliadiere canceled out Emmanuel Adebayor's opener. At the time, the draw left Arsenal eight points adrift of the top spot in the league and while it would prove to be the third match in an 21-match unbeaten run in the league, Arsenal drew nine of those and never climbed higher than fourth. The two clubs have met seven times in the FA Cup, with Arsenal winning five of the seven ties. Most recently, the clubs met in 2004, with Arsenal advancing by a 4-1 scoreline. 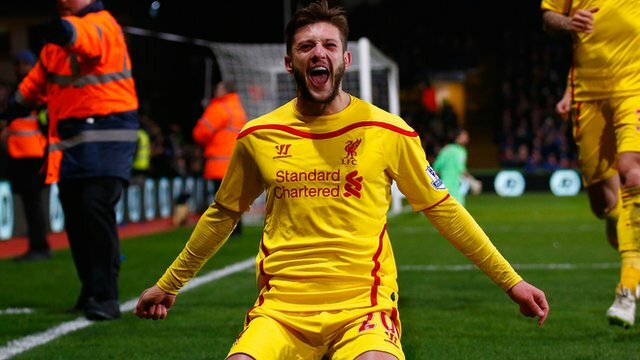 Boro would exact revenge a week later, knocking Arsenal out of the League Cup semi-final. The sides also met in the 2002 FA Cup semi-final at Old Trafford, with Arsenal winning 2-0, en route to the "It's only Ray Parlour" win over Chelsea in the final. Arsenal also defeated Boro in 1930, 1983 (via a replay,) and 1998. Boro's FA Cup victories over Arsenal came in 1977 and 1984.
the first half penalty that gave Arsenal a 1-0 lead. The referee is Wirral-based Mike Dean. Arsenal's negative string of results with Dean in the middle feels like it's in the ancient past now, especially after Dean was in charge of Arsenal's 2-0 win over Manchester City at the Etihad last month. Dean was also in charge of Arsenal's 2-1 loss to Manchester United in November; that loss snapped an Arsenal five match unbeaten streak with Dean as the referee. Dean has worked three matches this season involving Championship clubs (two Championship matches and last round's Aston Villa v. Bournemouth match.) Middlesbrough have yet to have him for one of their matches. The Boro have not seen Mike Dean since November 29, 2011 when he took charge of a 2-0 loss to West Ham United at Riverside Stadium. John Painting is a contributing writer to The Modern Gooner and the longest running sitcom in history. You can follow him on Twitter @zorrocat for all 10,247 episodes. Watching West Ham United lead Manchester United for much of the second half on Sunday only to concede a late equalizer that sent me to the bathroom to vomit (or was that the hangover? ), I remarked that there's so much parity towards the top of the table this season that a very talented club is going to come in seventh. That's the battle Arsenal finds themselves in now: eight points separate third from eighth place. Arsenal basically find themselves in the middle of that pack; three points out of third, yet sitting in sixth place. It'll be a dogfight between Arsenal, Southampton, Manchester United, Tottenham Hotspur, Liverpool, and West Ham United. Four of these six clubs play each other during this midweek round of fixtures, as Spurs visit Liverpool at Anfield and the Hammers head to Southampton, which means points will be dropped. From Arsenal's perspective, last place Leicester is not the kind of club you can drop points to at home and expect to finish third. Anything less than all three points today will be much more damaging in the long run than last weekend's derby loss. ALEXIS SANCHEZ IS BACK!!! !!!!!!!!!! !!!!!!!!!! !!!!!!!!!! !!!!!!!!!! !!!!!!!!!! !!!!!!!!!! !!!!!!!!!! !!!!!!!!!! !!!!!!!!!! !!!!!!!!!! !!!!!!!!!! !!!!!!!!!! !!!!!!!!!! !!!!!!!!!! !!!!!!!!!! !!!!!!!!!! !!!!!!!!!! !!!!!!!!!! !!!!!!!!!! !!!!!!!!!! !!!!!!!!!! !!!!!!!!!! !!!!!!!!!! !!!!!!!!!! !!!!!!!!!! !!!!!!!!!! !!!!!!!!!! !!!!!!!!!! !!!!!!!!!! !!!!!!!!!! !!!!!!!!!! !!!!!!!!!! !!!!!!!!!! !!!!!!!!!! !!!!!!!!!! !!!!!!!!!! !!!!!!!!!! !!!!!!!!!! !!!!!!!!!! That's really the only change. Jack Wilshere is back in full training, too. Predicted XI: Ospina, Bellerin, Mertesacker, Koscielny, Gibbs, Coquelin, Flamini, Cazorla, Alexis, Walcott, Giroud. In terms of absentees, Leicester City will be without Chris Wood until around next week and Kasper Schmeichel until March, both because of foot injuries. The big news out of Leicester this weekend, however, was the confusing status of manager Nigel Pearson. On Sunday night, there were a significant number of well-sourced articles claiming Pearson had been sacked following a bizarre incident on Saturday against Crystal Palace where he appeared to grab Palace midfielder James McArthur by the throat. As of right now, it appears that Pearson still has his job. Pearson has occasionally gone with a defensive 4-5-1 in road games, such as their 2-2 draw at Anfield, but after the £9m purchase of Andrej Kramaric in January, the Foxes have an extra option up top and are likely to stick with their preferred 4-4-2. No team utilizes the wings as much as Leicester. 76% of their passes in league play have come along the wings; that's the highest percentage in the top flight. I expect much of the attack will come through Jeffrey Schlupp along the left wing; without Mathieu Debuchy for much of the season, Arsenal have been exposed often down their right defensive side. On the other hand, most of Leicester's attacking this season has actually been done down the right, through Riyad Mahrez. Predicted XI: Schwarzer, Simpson, Morgan, Wasilewski, Konchesky, Mahrez, Cambiasso, James, Schlupp, Ulloa, Kramaric. This lumberjack condemned Leicester to defeat at the weekend. It's been a season of fits and starts, one where Arsenal just can't put together a month of solid form. The 2-1 loss at White Hart Lane on Saturday snapped Arsenal's longest winning streak of the season at five matches, across all competitions. In preparation for this section, I was all set to point out just how long it's been since Arsenal went a season without a winning streak of six or longer... until I found the answer was two seasons ago. Yes, in 2012/13, Arsenal's longest winning streak, across all competitions, was five. In fact, that winning streak didn't happen until March 13 through April 13 and it directly followed a 2-1 loss at White Hart Lane (you may remember Andre Villas-Boas saying Arsenal were in a "negative spiral.") Spurs were seven points clear of Arsenal on March 4 following that match; as you may know and as the song goes, it happened again. Arsenal's struggles for form this season aren't really any different than in seasons gone by; the difference is the quality of the other clubs around them this year. As for Leicester City, they've been stapled to the bottom of the table since a six-game losing streak in December, which came as the latter portion of a 13-match winless run. They responded in January, going unbeaten in three with wins against Hull and Aston Villa and a 2-2 draw at Anfield, but have since lost three straight. They are four points back of 17th place Burnley for safety. They will play five of the top eight clubs in the table over the course of their next seven league fixtures. These sides played out a 1-1 draw at the King Power Stadium in the reverse fixture back in late August. It was Arsenal's first league match without the injured Olivier Giroud and the display of toothlessness up front could not have come at a better time; the club bought Danny Welbeck the following day as the transfer window closed. Alexis Sanchez had the opening goal, but Leonardo Ulloa pulled back an equalizer two minutes later by beating a dazed Laurent Koscielny, who had suffered a head injury earlier in the match. Koscielny was eventually pulled for Calum Chambers only four minutes after Ulloa's goal. The last time this fixture was played, it was the final day of the 2003/04 season, Arsenal had already won the league, and Leicester had already been mathematically relegated. The only question was whether Arsenal could complete the league season unbeaten. The Foxes had other ideas; ex-Arsenal striker Paul Dickov gave the visitors a 1-0 halftime lead. Arsenal were awarded a penalty just a minute after the restart which Thierry Henry put away and Patrick Vieira scored in the 66th to give Arsenal the victory and the first unbeaten season in the modern era. Arsenal are unbeaten in their last 21 home matches against Leicester, across all competitions. The Foxes' last win in the red part of North London came on September 8, 1973 by a 2-0 scoreline. Leicester have won only six of the 58 league matches played between these two sides in London. 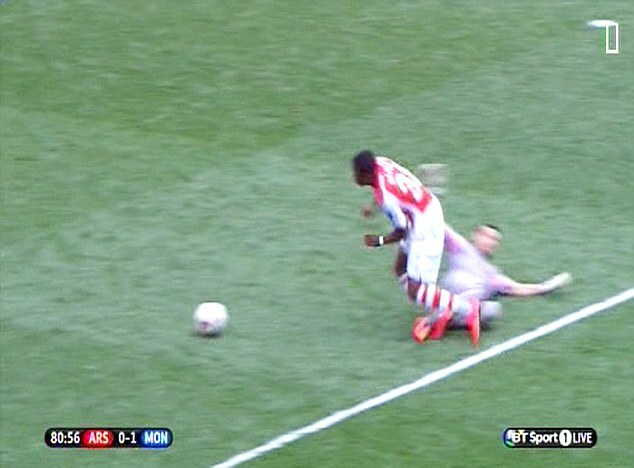 Here's Mike Jones sending off Samir Nasri. I figured you'd all appreciate that. The referee is Chester-based Mike Jones. Jones has taken charge of one Arsenal match so far this season, the 3-0 win at Aston Villa in September. Arsenal have a strong record overall with Jones as the referee, winning 12, losing two, and drawing one. The Gunners split two matches with Jones as the referee last season, losing 1-0 at Stoke to a debatable penalty, then winning 1-0 over West Brom late in the season when the result was academic for both sides. This will be Jones's fourth Leicester City match of the season; previously, he took charge of Leicester's opening day draw with Everton, their 2-0 loss at Swansea in October, and their 2-2 draw with Liverpool on New Year's Day. Jones has not taken charge of a Premier League fixture since that New Year's Day match. He worked the FA Cup tie between Birmingham City and Blyth Spartans the following weekend and has only taken charge of two Championship matches since then. Jones was dropped in early December after wrongly booking Sergio Aguero for diving, in what was ultimately a 3-0 win for City over Southampton.